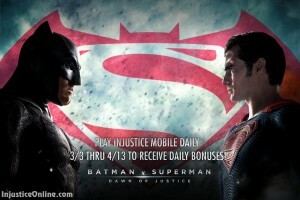 With Batman V. Superman: Dawn Of Justice almost here it is no surprise that Netherrealm Studios and Warner Bros. have decided to bring the movie closer to you by giving Injustice Mobile a Dawn of Justice update with version 2.8. The intro of the game, some of the graphics, new characters, challenges and daily bonuses have all been added. 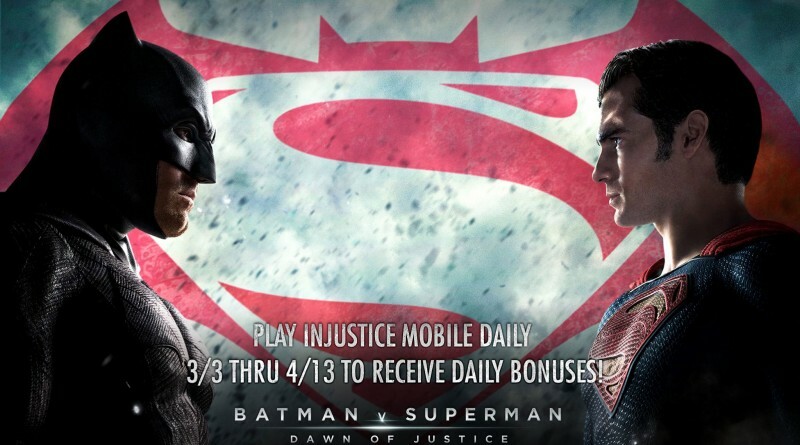 Batman v Superman Daily Login Event! Login in everyday starting on March 3rd and get a free daily gift. Make sure to log on March 25th for a special gift in celebration of the Batman v Superman movie opening! New challenges make their way to Injustice! Hope comes to Injustice with Dawn of Justice Superman! The Amazonian Princess, Dawn of Justice Wonder Woman comes to Injustice to prove her martial Superiority. The Thunder King, Kahndaq Black Adam comes super charged. Antimatter Sinestro emerges from banishment to exert his revenge on all who get in his way. Introducing the all-new Dawn of Justice Booster Pack. This is your chance to add Dawn of Justice Batman to your collection! Don’t miss out! 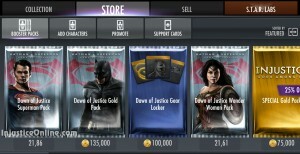 Dawn of Justice Gear Locker! 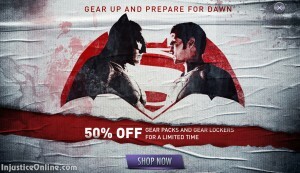 Complete your collection, this gear locker contains EXCLUSIVE Dawn of Justice Gear! Get the Last Son of Krypton, Dawn of Justice Superman early and bring an all-new Superman to your collection! 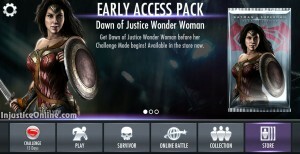 Pick up the Dawn of Justice Wonder Woman early and be the first to see the Amazonian Princess before her challenge! Coming Soon! Get Kahndaq Black Adam early to super charge your collection and rain thunder down on your opponents. Coming Soon! Pick up the Antimatter Sinestro early access pack and turn the lights out on those who oppose you. We made some adjustments to Survivor Mode and worked on the tuning of the game for difficulty where needed. What have been the challenge characters so far this year? anyone remember? So can I get dawn of justice batman in the Arkhangelsk knight pack? And if you bought ark ham knight on the Xbox should you get money or something? 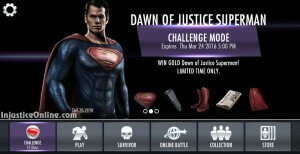 When are the other two Dawn of Justice Challenges starting? We will have to wait and see. It is possible that they will be coming as single player challenges. There will be a wonder woman challenge. 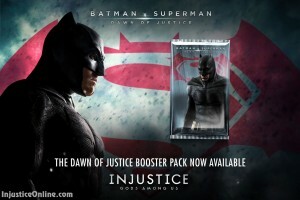 As for batman currently the only way is the booster pack. How can you get Aquaman to complete the new wonder woman challenge? He is not available! Justice league just appeared I see so all there now!! Unfortunately yes. Try to get him with some of the booster packs. Aquaman is available in the store ¡League of Justice Pack! Do you think guys Batman Dawn of Justice will be available to buy again, I already bought 4 of them an I need to get all 8 of him? Any idea about his pack? At some point definitely. When, I don’t really know. Single player challenges are rarely repeated. But some sort of booster pack might appear at some point. finished superman injustice 2 challenge! 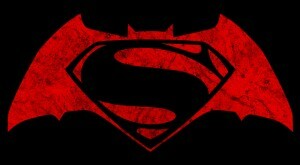 Will the dawn of justice thing return to injustice?? I need dawn of justice and suicide squad back again.. just came back after a long injustice hiatus..